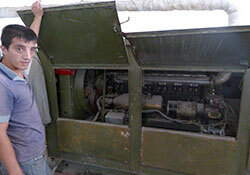 WHO will replace the broken generator at Tashkent’s City Emergency Hospital to ensure an uninterrupted electricity supply in the event of power cuts. WHO/Europe is assisting the Ministry of Health in Uzbekistan to train national experts in applying the Hospital Safety Index (2nd edition), which is a tool for assessing the safety and preparedness of hospitals to remain operational in emergencies and disasters. During a visit between 29 June and 3 July 2015, a WHO expert in preparedness and response trained 13 national experts in applying the Hospital Safety Index. The national experts included civil engineers with experience in hospital construction and maintenance; engineers and technicians familiar with electricity, water, sewage and heating systems in hospitals; medical technicians who maintain diagnostic equipment; and medical doctors involved in day-to-day work in hospitals. The multidisciplinary group then visited three hospitals in Tashkent—the City Emergency Hospital, the Oblast Multi-functional Hospital and the Republican Neurosurgical Hospital—to apply the tool, gather information about the hospitals' strengths and weaknesses and identify ways in which the safety, emergency and disaster management capacities of the hospitals could be improved. Three reports, with recommendations and calculated indexes, were submitted to the Ministry. The evaluation team presented its findings to the Deputy Minister of Health, Dr Saidaliev, at the end of the visit. Recognizing that more is required to enforce emergency preparedness in his country, Dr Saidaliev invited WHO to conduct more training in emergency preparedness and to assist in updating the country's emergency preparedness plans. The Uzbekistan team will now be able to undertake hospital assessments by themselves. Many of the recommendations made in the assessment reports are low-cost and can be implemented within the hospitals' budgets. Furthermore, WHO will provide a generator to the City Emergency Hospital, as no alternative electricity source is currently available to ensure uninterrupted functioning of the operating theatres and the intensive care unit in the Hospital in the event of power cuts. WHO strongly encourages national health decision-makers to apply the Hospital Safety Index and to allocate adequate resources to the health facilities at greatest risk for interruption of services in an emergency or disaster.